The Higher Council of the Egyptian Armed Forces have set up an Arabic-language Facebook page and it’s already a big hit. 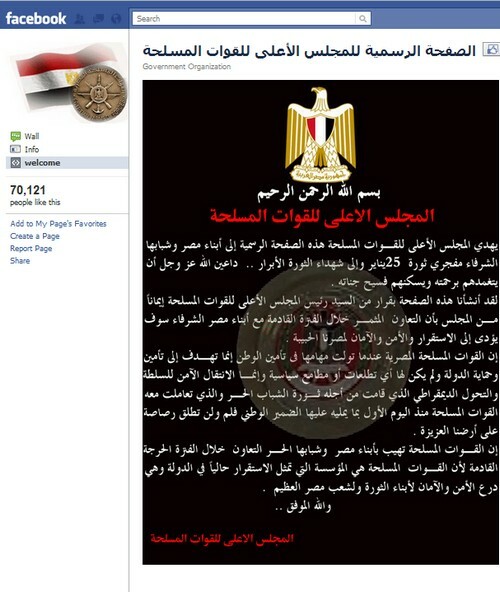 The new military rulers of Egypt have just launched an official Facebook page. As of Friday morning United States time, the page, titled الصفحة الرسمية للمجلس الأعلى للقوات المسلحة (Supreme Council of the Armed Forces), already had more than 75,000 followers on Facebook. The Egyptian junta’s Facebook page has extremely high traffic, which is unusual for governmental Facebook pages-—a symbol of just how highly social networking sites are valued by the young Egyptians who forced Hosni Mubarak out of power. The Egyptian Armed Forces’ Facebook wall consists of two posts, both photos of Arabic-language communiques affirming the importance of #jan25 movement protesters and stating the Egyptian military’s role in safeguarding reform. User comments on the Facebook page are, of course, written primarily in Arabic. Human rights activists note that the Egyptian military is still committing physical and sexual abuse on prisoners and detainees in custody. Egyptian activist groups still believe dozens of January 25 protesters, mostly belonging to Islamist groups, are currently in custody. The decision to launch the new Facebook page came on the heels of a viral internet video campaign to revive Egyptian tourism. For Internet observers in the West, the most important takeaway is the fact that the Egyptian military turned to Facebook for dissemination of propaganda rather than the larger web. In fact, the official Egyptian Armed Forces webpage seems stuck in the late 1990s. For the Egyptian junta, the future is clear: If you want to reach the masses, you stick with Facebook.